For twelve years I have been working on a trilogy of fantasy books. In that time I have lived in two different countries, three states, and six different homes. I’ve had eight jobs, gotten a Master’s degree, and gone through one marriage, one divorce, and two deaths in my family. Through it all I have been writing, among other things, this single epic tale. During the process, moments of boundless enthusiasm and despair mixed with long periods of just moving forward, doing the work, writing the next scene, the next chapter, the next book. 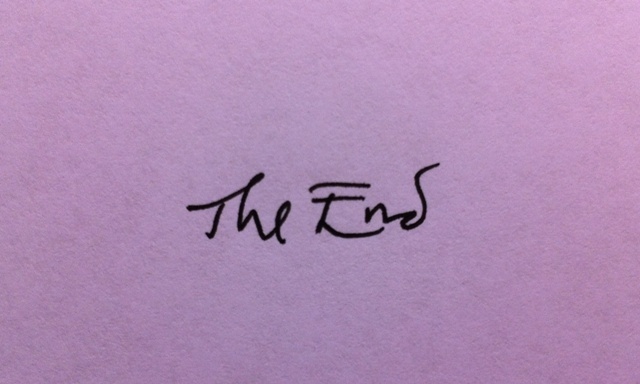 Last week I wrote THE END. I finished the last chapter of the last book and sat back, stunned by the moment and the magnitude of what I’d done. I had before me a single complete story spanning 300,000 words, roughly 1200 pages, and the occasion has gotten me thinking about finishing things, and endings in general. I’ve talked with a lot of new and young writers who say they enjoy writing, but have trouble finishing anything. The reasons vary. Sometimes writers get stuck on a problem they never solve, or lose interest in what seems like an idea that didn’t pan out. Sometimes their story isn’t really a story, but rather a series of events with no central conflict demanding an ending. Sometimes writers just lose faith, or have a moment of doubt that brings their work to a halt and they never go back to it. If the problem is technical, there is probably a solution if you work to find it, but sometimes the problem is psychological, a reluctance, for whatever reason, to finish. Either way, if you’re passionate about writing, you must persevere to an ending. At the very least so you get practice writing them. We all know a story must have a beginning, a middle, and an end. That’s why writing short stories is such good practice for the craft as a whole. They provide an opportunity to practice endings nearly as much as beginnings and middles. Elizabeth Engstrom says to “find your ending in your beginning.” I always think about this when I’m coming to the end of a story. It’s important to end the story you started writing, and not some other story you picked up along the way. A strong central conflict really helps make this clear. The end must match the beginning in a way, and I found this to be just as true in a 300,000 word story as in a 1500 word story. The end must deal with the same protagonist, issues, and conflicts introduced in the beginning. So if you’re searching for an ending, that’s a good place to start. When you get there at last, there’s nothing quite like the feeling of finishing a work of fiction. There’s a bit of magic in fiction, a sense of creating something tangible from the nebulous dreamscape of your mind. And when the last sentence is written, especially if it’s a good one, there’s a sense of triumph and relief like no other. If your project happened to take twelve years like mine did, there’s also a bittersweet sense of loss. All the unwritten scenes and plot puzzles and character arcs I carried around with me day after day … they’re all resolved now. The story is finished. The work is far from over, of course. I already have a number of other projects I’m working on, and in a week or two I’ll dive back in for more editing and rewrites. Eventually, I’ll start thinking about the next big project, and what I want to accomplish in the next twelve years!